I’ve been collecting fraternal objects for over a decade, starting back in the very late 90s with a few fezzes, bought out of general interest for the hats. I didn’t know exactly why I was buying them, but I thought they were cool. I also had no idea what exactly I was buying, just picking up pieces that I thought were unique in some way. Years later, after doing a lot of reading and research, I found that I had bought some pretty amazing pieces back when, purely on accident. After a few years of unfocused buying, I began to zero in on pieces that interested me for more particular reasons, including Tall Cedars pyramids and some Scottish Rite caps. One fall afternoon in 2006 I found and bought a small mid-century Teamsters Union dues booklet in an antique store. Examining and detailing this little thing, I was instantly hooked, and I asked for dues booklets for Christmas, and I continued to buy them on my own, as well, quickly amassing a small but good collection. In January of 2009 I found myself unemployed but not totally broke; so I did the smart thing and started trolling eBay. The year before I had grown interested in group portraits, and had gotten some yardlong photos of medical staffs, as well as some vintage sports team photos and portraits of military units. Now, unemployed for a few months and with more time than brains, I began to find group portraits of fraternal organizations and a light went on. Of course, it made complete sense to dovetail my group portrait collecting with my existing fraternal collections, as well. Spring of ’09 was apparently the time to jump off into this world, as well, as I was finding scads of these photos and for very little money. That’s one thing about my collection: it is for the most part (monetarily) worthless. But intellectually and personally, it is priceless to me. And I genuinely believe that some day it will be a great boon to a museum or two. Whether one of the larger museums that specialize in American fraternalism, or a museum that collects photography, or perhaps even just museum of American history: I collect with the thought in my mind that someday this all may go somewhere to live and be used and seen and studied. Is this piece “museum quality?” Why or why not? Maybe the condition is mediocre and the price kinda high, but is it a photo of a virtually unknown fraternal group? Get it. Is the condition fantastic and the price is minimal, but it’s just one more picture of one of the bigger Shrines that you see a hundred pictures from all the time? Who cares. I try to collect pieces that are worthwhile and interesting, even though I do sometimes buy objects that I refer to as “filler pieces.” (I won’t lie and say I never shrug and say, “Meh, why not.”) But I want my collection to be a resource for research on American fraternalism. Building that resource starts with documentation. That’s where this blog comes in. I custom designed a digital catalog system in 2008, just before I ended up unemployed, with which I document in some detail the pieces in the collection. The entries here are truncated mirrors of those catalog pages, bringing the images and basic descriptions out into the open for easy access. Welcome Brother Tyler to the museum community! I’m anxious to see your collection! Stay in touch so we can share some of the old fraternal pieces that we turn up! Is what you have pictured your entire collection? 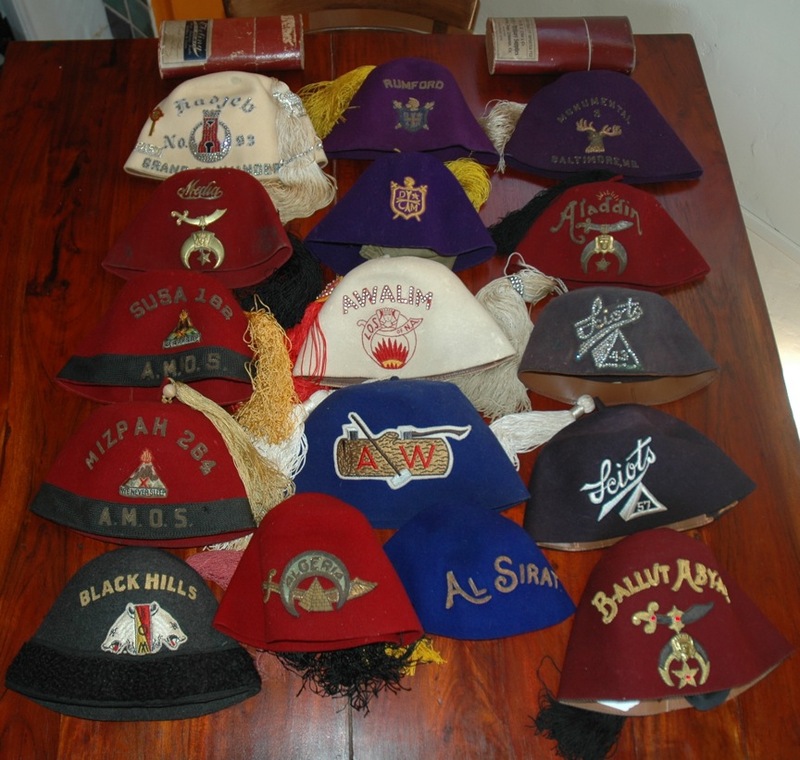 I have over 200 fez hats in my collection and might be able to share some information with you. Let me know. Do you have any Elks Lambskin aprons in your collection? I saw you have a DeMolay fez that says Rumford on it. Do you know where it came from? I’m a DeMolay Advisor in New Hampshire and we have a Rumford Chapter still in existence here. Interesting thought that it may have come from our Rumford Chapter! There are two Rumford Chapters that I could find reference to, one in NH and one next door in ME. Without any further specific marks, it’s impossible to tell which it came from. The founding dates of the Chapters could shed light, as the fez is pretty certainly from the 1920s at the latest, based on the materials and construction. Do you happen to know when the NH Rumford was chartered? I don’t know the Charter date off hand but I’ll check into it and get back to you, I do know its been around a long time.